Photographed at Western Care’s St Rita’s residential home, Claremorris, at the launch of the tenth annual Kathleen Conneely Memorial Charity Walk on Clare Island for Western Care Association on Saturday, June 24 were The Saw Doctors together with members of the Clare Island Walking Committee. Photo: John Moylette. 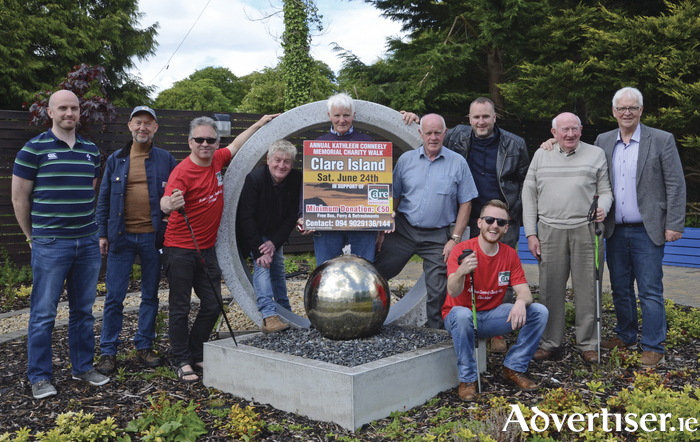 There was great excitement and fun at Western Care’s St. Rita’s residential home, Claremorris, recently, when the six members of the Tuam-based super group, The Saw Doctors, visited to launch the 10th annual Kathleen Conneely Charity Walk on Clare Island for Western Care Association local services. The group’s evocative song, Clare Island, penned by Leo Moran and Dave Carlton, is an enduring anthem that evokes the idyllic beauty and scenery of Clew Bay and Clare Island and the peace experienced by all visitors to the area. The 2017 Kathleen Conneely Memorial Charity Walk on Clare Island will take place on Saturday, June 24. This year is the 10th walk which attracts more than 100 participants annually. The hard working organising committee have raised more than €140,000 for local and regional charities, €40,000 of which has been donated to Western Care Newport Services over the past three years. Participants have a choice of several walking routes to various points on the island, each led by a member of the organising committee. None of them will be more than 10km, participants can walk as much or as little as they wish and they may also bring a bicycle to experience the beautiful land and seascapes of the island. Following the walks the island community will host a reception for all participants before they take the ferry back to the mainland. The cost is €50 per person or via sponsorship raised for Western Care Association (minimum €50 ) – this includes free bus transfer from Newport, Castlebar and Westport, free ferry crossing and refreshments. This year the beneficiaries will be Newport day, residential, and respite services, and St Rita’s residential service, Claremorris. Further details and sponsorship cards are available from Western Care Association on (094 ) 9029144, email: [email protected]. Online registration is available at www.iregister.ie/clareislandwalk2017 and up to the minute information is available on the event page on Western Care Association – Fundraising on Facebook.